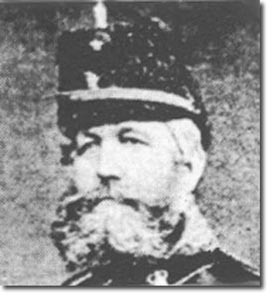 Palmer won his VC at Inkerman on 5th Nov 1854. He volunteered with two other men to accompany Major Russell in dislodging a party of Russians from the Sandbag Battery. Palmer shot a man who was trying to bayonet his officer. He was also in a small group who rescued the 3rd Battalion Colours. Anthony Palmer was born in 1819 in Brereton, Congleton, Cheshire. He died on 12th Dec 1892 in Crumpsall, Lancashire. The photo shows him wearing the uniform of an officer of a local Rifle Volunteer unit.